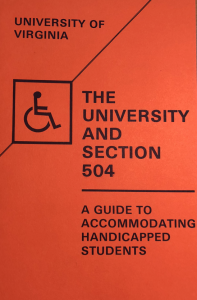 Cover of the 1981 brochure, “The University and Section 504: A Guide to Accommodating Handicapped Students.” The cover is orange, with black text and a black International Symbol of Access. Source: University Archives, University of Virginia. VP for Administration, Office Administrative Files 1983-1984, Box 4 Folder 21. Upon my arrival as a faculty member at the University of Virginia in Fall 2017, I began brainstorming methods for teaching courses about disability and mediation. While my research has long focused on how disability creates specific forms of media experience, how disability is represented, and issues surrounding media accessibility, I had not previously brought these topics to a classroom. Inspired by work on Universal Design for Learning, as well as more in-depth studies of academic access from Tanya Titchkosky, Jay Dolmage, and Margaret Price, among others , I wanted to make my classes broadly inclusive while also proactively exposing students who do not identify with disability to the alternative ways of engaging with media and experiencing university classes that many people with disabilities routinely experience. In the interests of universal design, I abandoned an attendance policy. Instead, students could receive credit for spoken participation in class, as well as for being active on our online forums and crowdsourcing notetaking wiki from within or outside the classroom. This structure eliminated the need for accommodations for students who may require flexibility regarding attendance, due to chronic health conditions, doctors’ appointments, fatigue, or injury. It also provided a means of ongoing access for students with attendance needs unrelated to disability; students who travel for intercollegiate athletics, who have a particularly busy week for whatever reason, or who made inconvenient travel plans are all provided with this alternative means of class engagement. In the interests of exposure, students in my Media & Disability class (MDST 3505) are now beginning a group audio description project. Building on the ideas laid out by Georgia Kleege and Scott Wallin, this project asks students to work together to consider what information creates media access, how to write for access, and how alternative means of experiencing audiovisual media can coexist with, and be as valuable as, a mainstream viewing experience. Similar exposure happens via the regular screening of captioned media content. Finally, through the inclusion of independent disability media texts, such as the forthcoming documentary Code of the Freaks and the webseries My Gimpy Life, along with videoconferenced conversations with their creators, UVA students are exposed to disability cultures and media criticism. Notably, my steps toward disability inclusion and exposure are made possible by the normalization and availability of digital media and the internet; without these media, it would be difficult to create alternative spaces for participation or to ask students to create accessible media. The existence of SDAC is, obviously, a major difference in the academic landscape for students with disabilities. It can provide official accommodations, offer assistive technology, and mediate between students and instructors. However, the growth of digital learning materials, accessible formats, and online course management systems have also vastly altered the accessibility of academia for students. The 1981 brochure is focused almost entirely on physical classroom accessibility. Some of the accommodations suggested include allowing preferred or front row seating, presenting material in written and oral formats, providing a notetaker, or ensuring physically accessible classrooms when needed. By contrast, many of the resources provided by SDAC focus on the accessibility of PDf documents, videos, and other media materials. Finally, much of the brochure, serves as a kind of introduction to possible differences caused by disabilities, and in this regard it is perhaps best understood as a historical time capsule. It cautions that D/deaf students may make errors in written English, reminds that seeing eye dogs are allowed in class, and warns that many “learning disabled students” “spend inordinate amounts of time on their assignments, depriving themselves of sufficient sleep.” Some of these remain valid reminders, while statements such as that about students with learning disabilities would certainly be considered outmoded and unduly prejudicial in a contemporary context. Notably, only vision, hearing, mobility, and learning disabilities are addressed. As more students now come to universities with psychiatric disabilities and attendant needs, different information would no doubt be included in updated resources. 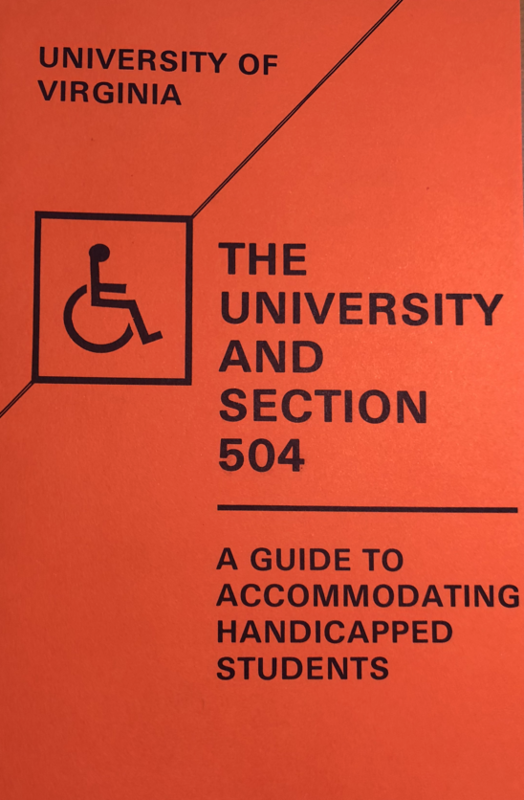 While there is certainly more work to be done in creating accessible and inclusive academic environments, this artifact of an earlier period in UVA’s history illustrates a significant change in resources, awareness, and policies regarding disability on Grounds. I share this document, and these excerpts, so that as we move towards greater access, we can also appreciate how far we’ve come. Elizabeth Ellcessor is an assistant professor in media studies. She studies media access and inequality, and her book Restricted Access: Media, Disability, and the Politics of Participation (NYU 2016) is the first history of web content accessibility. She is currently conducting research on emergency media technologies.